In this section you will find many beautiful jewelry sets that will add the finishing touches to any wardrobe. When Spaniards and Mexicans first came to the Southwest, they recognized the ability that the Indian peoples had with their hands and taught them how to use metal to make bracelets, earrings, and other items. It wasn't long until the Indians began using the silver pesos brought up from Mexico, and their jewelry started to grow from a silver beginning. 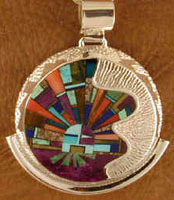 They began to incorporate the Turquoise from their own land into the ornaments they created. 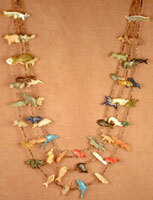 The greatest value of Indian jewelry is its intrinsic beauty. The Indians, with their cultural and artistic background, seem to give beauty to everything they touch. 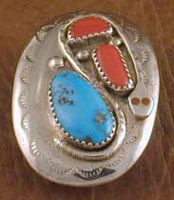 For many, an item of Indian jewelry immediately brings to mind the American Southwest. Most who visit the region today cannot resist selecting a special piece of Indian jewelry to take home as a remembrance of the fascinating people. Most who visit the region today, as in decades past, cannot resist selecting a special piece of Indian jewelry to take home as a remembrance of the gorgeous scenery and fascinating people. The following pages attempt to display many pieces that have caught our eye. You will find some very unique pieces along with some traditional items. We sincerely hope you enjoy this beautiful artwork as much as we enjoyed collecting them.